WHITEMAN AIR FORCE BASE, Mo. 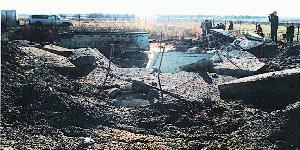 (AFNS) -- With the simultaneous turning of seven keys, a Cold War icon became obsolete Dec. 15 as the last Minuteman II missile silo was destroyed. The implosion of the silo was in accordance with the Strategic Arms Reduction Treaty signed by former U.S. President George Bush and former Russian President Mikhail Gorbachev July 31, 1991. The treaty took effect Dec. 5, 1994. The site, commonly known as Hotel-11, was located north of Dederick, Mo., more than 90 miles southwest of Whiteman. Whiteman was home to the 351st Missile Wing February 1962 to July 31, 1995, when the 351st MW and its missiles were inactivated. With 10,000 square miles of rural Missouri land dotted with 150 Minuteman II launch facilities and 15 launch control facilities, public support was necessary to sustain Cold War deterrence. Brig. Gen. Tom Goslin Jr., 509th Bomb Wing commander and former 351st Combat Support Group commander, said the partnership "worked extremely well, providing deterrence so there was never a war between the great super powers for over 30 years." Capt. Mike Busch, 509th Operations Group executive officer, said the day brought back a lot of memories. He was a 351st MW missile launch officer who was on duty when President Bush's directive came to safe the missiles. "I felt nostalgic; sad but proud to have been a SAC (Strategic Air Command) warrior and finely honed instrument of freedom," Busch said, recalling 213 alerts he pulled and the hundreds of hours of simulator, classroom and self-study time he conducted, training for day-to-day alert duty and full-out war. START established substantial reductions in the number of strategic nuclear weapons and delivery vehicles. In order to remove systems from accountability and meet these reduced levels, both sides must destroy or eliminate their deployed systems.